Duke won a hard-fought battle in Littlejohn Coliseum on Sunday, defeating Clemson 73-66 to remain the lone unbeaten team in ACC play. 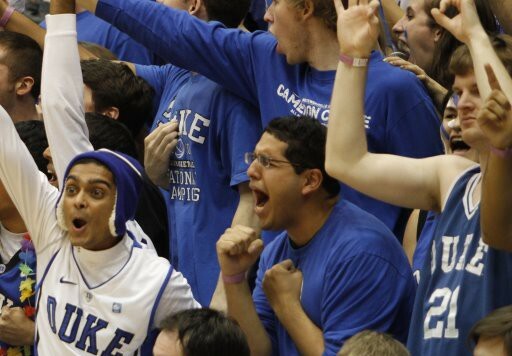 Clemson started the game off with a quick 6-0 run that might have led many a Duke fan to flashback to February 4th, 2009, when Clemson beat the living daylights out of Duke in the very same building. The quick start from Clemson led Coach K to pull a wholesale five-for-five substitution – something he’s rarely ever done – to jump start the squad. The Devils punched back with a 15-2 run of their own. Andre Dawkins then proceeded to proverbially “make it rain”, draining five three pointers and throwing down a monstrous dunk for good measure. Duke nursed a four point lead at the break and played much of the second half with a decent lead, but Clemson simply did not go away. The Tigers closed the gap to four on a K.J McDaniels jumper to make it 65-61, but Dawkins drilled a three-pointer on the next possession to put the game, as Chick Hearn would say, in the refrigerator. Coming off of a great win at home against a strong Virginia team, Duke could have laid an egg (like, ahem, some other squad) on the road this weekend. It was great to see this young team walk into what could have been a bear trap, take a few punches, and fight right back. Andre stepped up with his best performance since the win against Michigan State. And this game followed what Coach K called the “best defensive game of his career” against Virginia. The biggest issue to date with Andre has been consistency – on both ends of the floor. If Dre can provide offensive firepower and play good quality defensive minutes off the bench night in and night out – this team will improve that much more. Speaking of consistency: Austin Rivers has struggled to score consistently during the past few games. Rivers scored a season-low four points on 2-7 shooting. Some of his recent struggles can be attributed to the fact that he has been matched up with taller players on the opposing team, but for the most part, Rivers has simply not shot the ball well. In five games so far in 2012, Rivers has shot a combined 16-44 from the floor – good for 36.3%. Let’s hope he can break out of his shooting slump sooner rather than later. It’s a shame that none of our three stud shooting guards – Curry, Rivers, and Dawkins – have been “on” on the same night thus far. All it takes is for two of the three to be on the same page – and Duke becomes nearly unstoppable. Taking it the opposite way – if only one, or worse, none of them are shooting well, Duke is in deep trouble. The Temple and Ohio State losses are cases in point. Miles Plumlee had a great game on Sunday – and continues to contribute in a really positive way for this team. He collected 14 boards on Sunday night, six on the offensive end. Although he was responsible for four turnovers, it’s encouraging to see Miles make a concerted effort to get on the glass and extend possessions on offense. Speaking of Plumlees – Mason had another solid game, posting up 12 points and 7 boards. But most importantly – Mason went 4-4 from the free throw line. Let’s repeat that, shall we? Mason went 4-4 from the free throw line. That means he didn’t miss. He’s made his last nine free throws (!!!!) on the road, while making only four of his last fifteen in Cameron. Maybe it’s our fault? Quinn Cook (#nohim) was great in his third consecutive start, registering 10 points and 2 assists and showing a lot of promise. Karl Hess is a clown. The flagrant called on Miles was just ridiculous. There’s really not much you can say – especially after watching the replay. Marshall Plumlee’s interview skills continue to impress. It was hard to imagine anyone taking the DBP spotlight away from the one and only Nolan Smith, but Marshall has quietly become one of the best DBP video hosts – ever. Check out his latest offering below, with quotes from Miles and Dre on their great performances last night. That’s all we’ve got for now. Check back with us for more stuff later on this week, including a look ahead to Thursday’s matchup with Wake Forest. Go Duke, and #GTHC.